Few areas of law practice cover as many issues as family law. The subject embraces marriage and divorce, annulment, custody of children, spousal and child support, complex property issues, paternity, domestic violence, adoption, and alternative means of reproduction. Each of these topics itself is complex. For example, within the broad subject of child custody lie the issues of interstate move away cases, international parental child abduction, and the impact of domestic violence on a parent's right to custody or visitation. 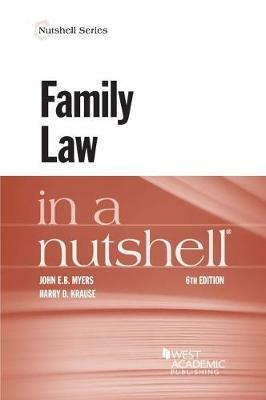 In addition to purely legal issues, family law has a large psychological component, touching on some of the most important and sensitive aspects of human nature and interaction, such as, what is a family, what are the rights and responsibilities of parents toward children, and how should society respond to child abuse and domestic violence? All of these issues, and more, are discussed in this Nutshell. The book provides a thorough introduction to this challenging field of practice.